Rusty: In this lesson we'll look at a ballad that sounds similar to "Sleepwalk" or a 50's type slow song. I recommend listening to Brian Setzer's version of this song. The lesson example has two parts, a verse and a chorus. The licks over the chorus are mainly arpeggios and scales. This part is great for exercising as many arpeggios that you know. Rusty: This is the Chord Chart for both parts. Rusty: The verse is pretty close to the "Sleepwalk" progression but I substitute a Dm7b5 for the Fm every other 4 bars. The chorus is something different to break away from the original song. The whole song is in the Key of C. We do break away from that briefly over the F minor and the D m7b5. This example is recorded in 6/8 timing which was a popular time signature for ballads in the old days. It still is today, but there were a lot of popular hits around that same time that were recorded in 6/8. Rusty: Let's look at the basic chords for the verse and then we'll add in the 6/8 time signature. Rusty: These are basic chords so you could change them if you like. I prefer to play the ones I've shown you. Now we want to add in the 6/8 time signature. The 8 defines the type of note which 1/8 would be an eight note. There are 6 beats to a measure, so we have 6 eighth notes per measure. This picture will show you how to count. Rusty: This next tab shows you the same basic chords while playing each note of the chord. You can hear the count 1-2-3-4-5-6 before the change to the next chord. Rusty: I prefer the way they are written, but you can use what you like. 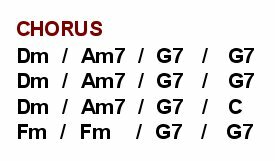 All of the different voicings you can think of should work. Rusty: This audio file uses a triplet over the 2 and 3 beat. The last picture would show you how to count this. 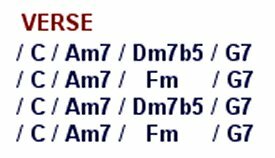 This is a common rhythm progression that is used a lot with songs in 6/8. Ideally you would want another instrument playing this part in the rhythm like an acoustic or a piano. I prefer to jazz it up just a little by using these next chords. Rusty: I'll show you an example that will better define sweep picking later. Lick 1starts out with a rake over the G augmented chord and then moves into some octaves while staying close to the original melody. Then there is another rake over the Dm7b5 in lick 2 which adds to the "sad" sound that the chord progression tends to give. Then more octaves. Rusty: By the way, I'm hybrid picking all through the song, using a pick and my middle finger. In case you were wondering. Rusty: Lick 3 uses the same rake over the Dm7b5 and then a few melody notes back into C major. Rusty: Lick 4 has a cool sound because we're using a triad that is found in the C major 7 and sliding it back until we play the C major again. The video is the first four licks together. It's just of the right hand since that will be the most important. I rake through the chords with my pick and strike the last note with my middle finger. You'll be able to see in the video. That's how I get that sound in the licks. Rusty: All throughout this song I'm keeping two things in mind. One is the C major scale which is my key signature and arpeggios. The Fmin6 and Dm7b5 are made of the same notes. Those key chords are what make the mood of this song. They briefly take us out of C major. I find it easier to think of using arpeggios over those two chords rather than changing the scale. We'll use some of those arpeggios later in the song. Rusty: The next 16 bars or chorus uses arpeggios with a basic 6/8 timing. On the tab I have put the chord changes above each bar. Rusty: By default the neck displays the finger numbers. You can change that to scale tones and it will show you the arpeggio pattern with respect to C major. The next seven videos are of the left hand. It will be the most important for the arpeggios. All along I'm using down-up-down strokes with my pick to play the licks. Rusty: Lick 5 uses an arpeggio for the Dm and the Am. Over the G, I connect it's dominant 7 arpeggio with the C major scale. The same thing happens for the next licks (6,7) except I'm working out of a different position. Rusty: You can hear how the chorus flows with the chord changes. That's one thing that is cool about arpeggios. If you play the right arpeggio with the chord progression it incorporates both the feel of a lick while also keeping the rhythm. Rusty: Lick 8 is played over two bars in Fm and two in G. Here I apply the same principal by ascending with the F minor arpeggio but descending with the F minor scale. The two bars of G are a G dominant 7 arpeggio. It has the same notes as in the C major scale. Rusty: Lick 9 takes us back to the melody. Here I start using some of the arpeggios adding in some triplets. The first part is over a C major7 arpeggio and the working back through the C major scale in that position. That takes care of the C and A minor. Next we rake over the F minor triad in that position sliding back to the B note or 3rd of G. Then we end the lick by raking over part of the G7#5 and playing a few more melody notes. Rusty: Lick 10 uses some octaves. Most of them work right around the C major 7 chord in that position. Rusty: Lick 11 is an arpeggio over the F minor and uses some of the F minor scale and then resolves the melody. Rusty: The next nine licks are played over the second part of the song. Most of them are in the same position as the first series of arpeggios. They are meant to be played as 1/8 notes. That will make them faster and more difficult to play. I play all of them with a pick. The main point is to reference the arpeggio with the backing chord(s). Most of the time I'm changing with the chord. So if I need to play over a D minor, I'd use a D minor 7th arpeggio. Once you've got the basic idea down you can start to make up your own licks using the arpeggios I've given you. Rusty: Lick 12 is basically like Lick 5. Except we're playing just over the D minor and A minor. The difference is Lick 12 will twice as many notes for two bars. The part over the D minor uses a D minor Arpeggio and the part over the A minor is ascending back through the C Maj 7 or the relative major of A minor. Rusty: Lick 13 is basically the same as the last two bars of Lick 5. Here we're playing over two bars of G7. The first bar moves around the G7 chord at the 7th fret then it comes back descending through the C major scale. Notice how I use the C major scale a lot. It's like a net, in case you get lost. Everything in the C major scale will work with this song except when playing over the F m.
Rusty: Over lick 14 I'm playing around the D minor and A minor chord shapes. You can see the lick over D minor falling straight out of the D minor Pentatonic. The lick over the A minor is focused around that A minor triad with the root on the 10th fret 2nd string. Rusty: Lick 15 is another example of sticking to the C major scale. Even though the backing chord for these two bars would be a G7, I stick to the C major scale. The first part descends back through the C major 7th arpeggio and then resorts to the C major scale. Rusty: Lick 16 is a good arpeggio that moves through two D minor positions. I took the lick off of Eugenes Trick Bag (The Duel from The Crossroads) by Steve Vai and changed it just a little to suit the needs of the song. The best thing to get from this lick is the connection between the two positions. It takes a little practicing and handy work to be able to do this. The biggest part is knowing where to start and where to go with the lick. If you learn all of your arpeggios up and down the neck you'll want to start connecting them like this. Rusty: I can't tell you how many times I used Lick 17 throughout this CD. I believe I put it in every example although it may be in a different key. I think it has a jazzy sound to it with the chromatics and phrasing. It will work over a C major and an F major. If you wanted to play it over an A minor, start at the 12th fret 5th string by beginning with the A note. That will easily change the lick just a bit to incorporate the minor sound. Rusty: I would learn lick 18 and 19 together. You can use this lick over and over in just about anything. I normally do, so you might see it again in other lessons. The first bar in lick 18 is base around the C major triad with root on the 8th fret high E string. The lick has a jazz taste to it because I'm constantly playing through the b5 or Gb. Since we're using a lot of triads, it gives it the swing sound. From there I move into the C minor (blues) scale. The b5 will bridge the major scale and minor scale together. If you look at the lick close enough, I'm really coming from a major shape while using a lot of chromatics and then moving into the minor shape. It's an exercise I commonly do to try and build new licks. Rusty: Over lick 19, I'm working into the G7 (root 10th fret of the 5th string. You might think of this as an arpeggio or again the C major scale. Regardless you should see that chord being played around. Once I'm there I link it together with another C major triad (root 13th fret, 2nd string). The lick then ends with a chromatic run through the b3rd, 3rd, and 4th of C up to the bend on the high G. The two licks build up nicely up until the point where we go back into the verse. So it's a dynamic lick altogether. You'll want to remember this lick by the C major shape that it began with so you can transpose it. It should work over any major chord progression. Rusty: For lick 19 and 20 we are back into the original verse. You could do just about anything at this point. End the song, take another solo, let another instrument play, or go back into the melody. Since we've gone through a lot of arpeggios and major sounding licks, the minor blues will add a different touch to the song. Also at this point the rhythm and the other licks have built the whole example up, which with the minor blues you can really start to play with feeling. Lick 19 and 20 come from the C minor blues with some other notes but I'm thinking mainly blues at this point. Rusty: This was a really fun example to make up and play. Sleepwalk is a great song that everyone loves. You'd be surprised at the reaction you'll get from playing it anywhere. Hopefully this example will help you with other songs such as this one. You can also apply what I've shown you here to any type of music. Arpeggios will get you out of the scale rut and it also adds a different quality to your solos.